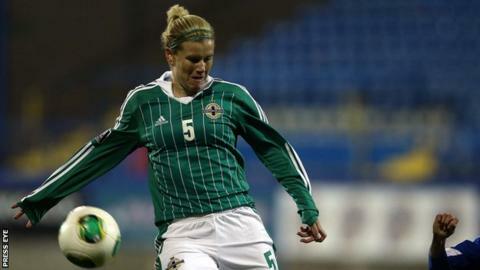 Northern Ireland's women made an impressive start to the Euro 2017 qualifying campaign as they earned a 3-0 win over Georgia in Tbilisi. Captain Julie Nelson put the Northern Irish ahead after three minutes as she connected with Avilla Bergin's corner. As Northern Ireland continued to dominate, Bergin doubled the lead on 28 minutes, stabbing in after a Nelson free-kick had struck the woodwork. Bergin hit her second goal on 56 after being set up by Rachel Furness. Tottenham's Bergin went close to netting a hat-trick as she also struck the woodwork for the dominant Northern Irish. Alfie Wylie's 66th-ranked side dominated against a team lying 118th in the world, with Northern Ireland having 19 shots on goal compared to Georgia's two. Northern Ireland's next game, as they attempt to match the men's European finals qualification, will be at home to Switzerland on 27 November.